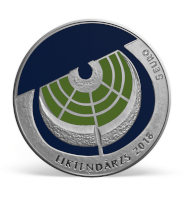 October 18, 2018 – Latvijas Banka has issued a silver collector coin dedicated to the Garden of Destiny. The idea of the Garden of Destiny came as a response to a heartfelt desire of the people to create a national memorial site in honor of those 600 thousand people of Latvia who suffered and perished during totalitarian regimes of the 20th century. Latvia / 5 euros / silver .925 / 31.47 g / 38.61 mm / Design: Franceska Kirke / Mintage: 3000. On June 7, 2005, a group of initiators established the Koknese Foundation. Its aim is to create a memorial site symbolizing the nation’s grief for the victims, commemorating their lives and resilience, but also inspiring Latvia’s people for the future. The donation of 640 thousand euro by Vilis and Marta Vitols formed the initial capital of the Koknese Foundation. Since its launching, 2.5 million euro have been invested in the project. The Garden of Destiny is rising on an island in the Daugava River near Koknese. This picturesque area is a crossroads of cultural and historical diversity of Zemgale, Selija and Vidzeme where threads and vibes of Latvia’s history and mythology intersect. The author of the Garden of Destiny concept and the winner of the international competition is Shunmyo Masuno, a Japanese landscape architect. The landscape conjured by him gradually transforms the visitors’ grief and sorrow into reflective healing of the soul, making people ready to meet the eternity, embodied by timeless light, wind, water and earth. The Garden of Destiny is nurtured as the nation’s present to Latvia on its centenary. The Freedom Monument is a legacy from the generations of the previous century; the Garden of Destiny will be the legacy to the future generations. It is memory, inspiration and strength. 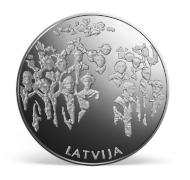 To find out where you can purchase this commemorative coin, please visit the Latvijas Banka website. The official website of the Garden of Destiny offers a lot of additional information on the historic site and aims of the project.